The end game in college football each season is to take home a national championship. It’s why recruits commit to certain programs. It’s why players work so hard in the offseason. It’s what makes all the blood, sweat, and hard work worth it. But just because that may be so, it doesn’t mean that every young player hasn’t one time or another struck that famous Heisman pose that comes with individual glory. And if you haven’t, we highly recommend you to — it’s great fun. 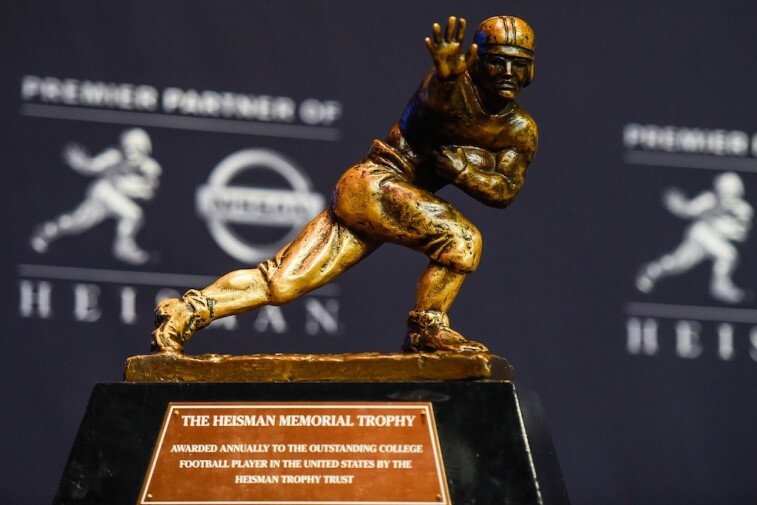 The Heisman Trophy is the most prestigious award in all of college football. Not only does it distinguish a player from the majority of those who’ve played the game before them, but it immortalizes them within one of the most exclusive fraternities in all of college sports. Following last year’s inaugural College Football Playoff, we took it among ourselves to compile a list of our leading candidates for the 2015 honor. However, while we thoroughly remain committed to our picks, others happen to see things happening a bit different. We’re specifically talking about the offshore bookmaker Bovada who, as of July 7, released it’s latest batch of odds for the 2015 Heisman Trophy winner. After taking a gander at this series of picks, we have to admit, we’re not opposed to the selections. Therefore, we feel inclined to pass along who the oddsmakers believe are in the best position to succeed former Oregon Ducks quarterback Marcus Mariota. With that in mind, courtesy of the Bovada, here’s your Cheat Sheet to the five Heisman favorites for 2015. No Todd Gurley, no problem. That’s pretty much the consensus down in Athens, after bearing witness to running back Nick Chubb‘s outstanding season last year. 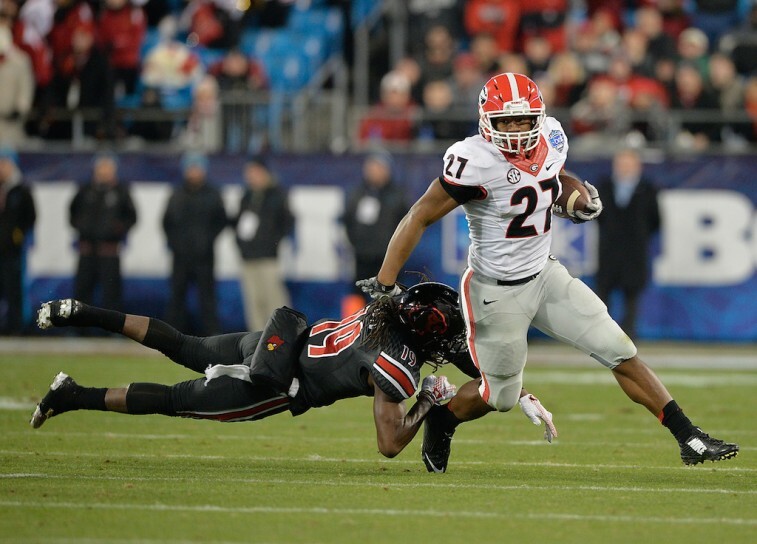 Despite being just a true freshman, Chubb exploded onto the scene. He rushed for 1,547 total yards, 14 touchdowns, and ended the season with eight consecutive games of at least 100 yards on the ground. This kid is such a skilled back that NFL draft analyst Lance Zierlein believes he may already be as talented as his predecessor. Bovada seems to be well aware that Chubb will be the focal point in the Georgia Bulldog offense, as it’s since improved his Heisman odds from 12/1 in January to 10/1 in July. Jeremy Johnson wasn’t even on Bovada’s radar when it released it’s initial Heisman odds back in January. 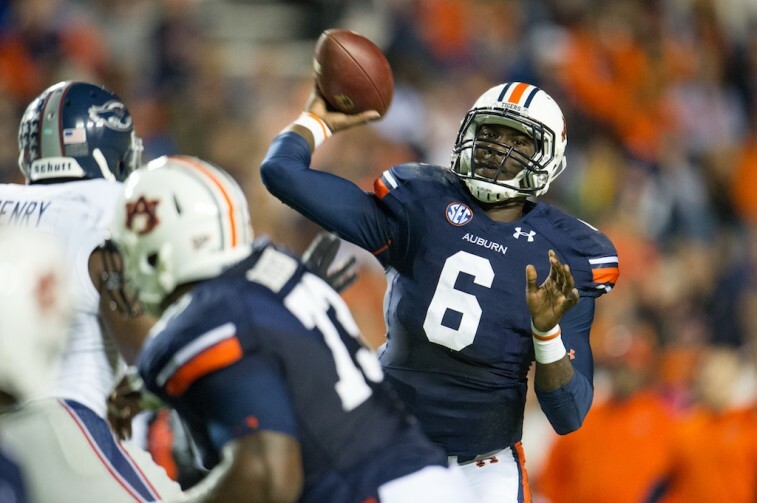 However, with Nick Marshall no longer in the picture, the 6-foot-5, 240 pound Junior will be the man under center for Auburn and there are high hopes for his first full season as the Tigers starting quarterback. His coaches are certainly excited about it. It won’t be too long before we can see for ourselves if Johnson can live up those ten-to-one Heisman odds. The Ohio State Buckeyes find themselves in the fortunate position of having three legitimate quarterbacks who are good enough to help this team defend its national championship. 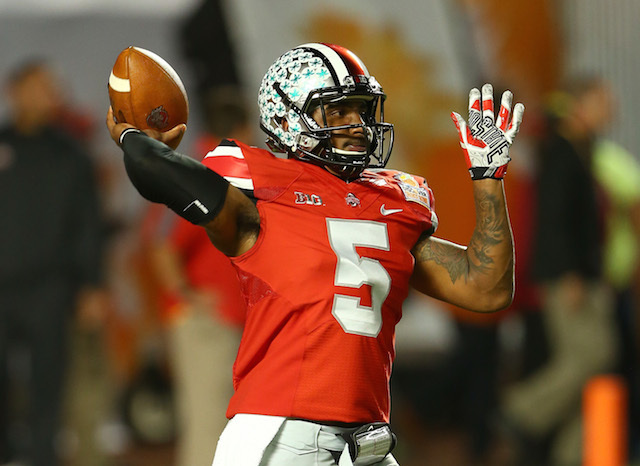 Interestingly enough, despite missing the entire 2014 season with a shoulder injury, Bovada has Senior quarterback Braxton Miller as its early favorite among the three Buckeye gunslingers. Miller had a great 2013 campaign, throwing for 2,094 yards and 27 touchdowns, while adding 1,068 rushing yards and 12 touchdowns on the ground. He was considered a Heisman candidate heading into last season, but his hopes were derailed by the injury. Although he’ll still have to win a quarterback competition if he hopes to be the man in Columbus, the odds to strike the famous pose are in his favor at ten-to-one. Following a Beast Mode-esque performance of 246 rushing yards and 4 touchdowns in the College Football Playoff National Championship game, running back Ezekial Elliott put himself firmly in the conversation for the 2015 Heisman Trophy. In fact, up until Bovada released its current odds, it was Elliott who found himself at the head of the class. Considering he played his best football at the end of the season, ran for almost 2,000 yards, and helped lead Ohio State to the national championship, we think anything close to that type of performance in 2015 should at least help the Junior back secure a seat at the Best Buy Theater. For now, though, he’ll have to settle for second with seven-to-one odds. TCU quarterback Trevone Boykin put up monster numbers last season. He was so good on the field that he wound up in fourth place in the 2014 Heisman Trophy voting. With Boykin under center, the Horned Frogs have a legitimate chance at making the College Football Playoff. It’s for this reason that Bovada has him out in front in the 2015 Heisman race with six-to-one odds. Should Boykin manage to duplicate his 2014 season and put TCU in a position to win the national championship, he could very well be lifting college football’s biggest individual prize at the end of 2015. All statistics are courtesy of SR/College Football and ESPN.go.com. To see the complete list of 2015 Heisman Trophy odds released by Bovada (via CollegeFootballTalk), click here.